Location, location, location. It's the battle cry of real estate agents across the land, and it's also an applicable mantra for meeting and event planners when staging conferences, events and exhibitions. But in this competitive field, where, at the end of the day, a client's (or management's) expectations depend solely on the planner's ability to orchestrate minute details with seemingly seamless grace, the venue itself-no matter how grand or elaborate-must deliver much more than just a mere sense of place. And whatever or wherever it promises to be-from a convention centre, to a hotel or resort, to a special, off-site venue -the impact of the event revolves around the special partnership that's created by the planner and the venue staff. The success of any meeting or event grows from the planner's ability to convey exact information to the venue - and have their staff deliver on every detail. It's this level of communication, and a strong commitment to impeccable service, which keeps planners coming back to hotels and resorts as can't miss venues. "Business is always won by the site, but communication is key to our planning culture," explains Corinne Chabun, director of catering and conference services at the Delta Victoria Ocean Pointe, a full-service resort overlooking a gorgeous bay on Vancouver Island. Like many hotels and resorts, the Canada-wide chain of Delta Hotels and Resorts is upping the ante when it comes to communication and service. Delta recently instituted a "meeting maestros" concept that engages employees at all levels of service to "wow" the client in a particular fashion, says Chabun. "We answer enquiries within 24 hours and [immediately] brainstorm with the entire team [from housekeeping to engineers] to present creative solutions to the client's needs." For example, when Campbell's of Canada Inc. came to the resort for a recent site inspection, the venue displayed the company logo on a screen in the meeting room, alerted room attendants to talk about the room and services, and asked restaurant staff to greet the company CEO by name. "After confirming the booking, we learn as much as possible about the client, and try to be creative on their behalf as an extra added value," says Chabun. "For example, for Cloverdale Paint, we painted their areas in a rainbow of their colours and used drop cloths splattered with their paints as backdrops for the buffets, centerpieces and coffee stations. And we do whatever possible to tie into the theme with food, beverages and décor, such as creating Tony the Tiger Martinis for Kellogs." To ease the organization process - particularly when someone in the company has been delegated to look after the details - Delta's meeting maestro provides useful tools: a check list of dos and don'ts; a spread sheet to structure an on-line booking system so the company can handle its own reservations (with questions for smoking, etc., that helps create a delegate profile). Indeed, it was the convenient location - near the forestry lab - that first drew the federal agency to the Delta Ocean Pointe Victoria resort for a week-long program, says Jane Foster, administrative assistant for the National Forest Information for the Canadian Forestry Service. "But the best advantage was the hotel's versatility," adds Foster, "How they set up so delegates arriving from across the country could meet and mingle, and organized activities from visits to Butchart Gardens to whale watching." Given the right strategy, smaller properties can be equally welcoming and efficient for groups - especially if the group can 'take over" a resort. 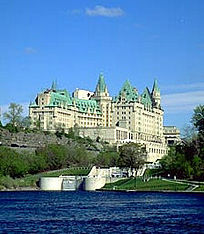 As symposium coordinator of the Ottawa-based Canadian Medical Protectorate Association, Margaret Chartrand typically chooses standard hotels or conference centres for its educational programs, but gravitated to Langdon Hall, a Relais & Chateaux property in Cambridge, Ontario, at the suggestion of the local medical society for a recent meeting for 65 doctors. "It was totally out of the ordinary, but we loved the urban-country mix; the courteous service and delicious meal in the dining room. Best of all, the speakers and staff [who slept over] commented on the sheer luxury of the bed and their wonderful sleep." While hotel and resort properties can be ideal for groups, challenges can arise, especially when a planners' needs juxtapose those of the hotel or resort establishments. A case in point is the dilemma occasionally facing Melanie Hudson, Office Manager for the Ottawa-based Industrial Gas Users Association. Hudson's criteria depends on the nature of the two major annual meetings: a spring gathering designated for a major city with an industrial base that suits the association; and a fall meeting in a convenient rural location. As the city-based meeting with a maximum of 500 delegates requires high meeting and banquet space in relation to bedroom space, the city location has become increasingly difficult to secure as hotels (which want to maximize profits) are reluctant to provide quotes more than 12 months in advance - a problem for an association that typically books two and one-half years out. "In each city [Toronto, Montreal, Quebec City and Ottawa], only five or less properties can accommodate us because we have a trade show, a sit-down lunch with entertainment and a panel session," she says. "Today, securing a venue involves a lot of time shopping around." Meanwhile, Hudson has experienced repeated success at the Chateau Cartier in Aylmer, Ontario for the smaller meeting typically catering to 250 delegates for 3 days. "The resort, with a golf course on site, is conveniently located a short drive from the airport; the food and service is good and the staff are flexible…even waiting until the last morning one time to determine whether a meeting, planned for a tent outdoors, should be moved indoors." Convention centres are a logical venue choice for many events, but while some companies may construe them as lacking personality or warmth, the new thinking is these massive, multi-purpose venues offer everything from superb technology to theme décor. Take Prairieland Park, the versatile 180,000 square foot establishment in Saskatoon, Saskatchewan. It attracts a wide variety of functions from huge trade exhibits to lively cabarets, and is adding a connecting building of 43,000 square feet with another trade hall as well as multi-purpose meeting rooms for spring 2006. Caroline Laird, the facility's rental manager, says the venue's accommodating staff - including production coordinators, facility supervisors and operations department - works hard at client and customer retention. She cites a client roster that includes the Allied Beauty Association, Federated Co-op Buymart, and McLaren McCann (who organize their annual launch of the new General Motors vehicles here), to name a few. When selecting convention centres for events, Laird advises planners to start by establishing goals, then clearly communicating the objectives of the event to convention centre staff. "The communication process right from the start is so critical," she says. Improving the lines of communication between planner and supplier is paramount at the Metro Toronto Convention Centre in Ontario's capital city. In July, the MTCC will launch a revamped Web site that serves as a comprehensive resource for planners using the venue. "We know more now about the kind of information planners want and how they want it displayed," says John Houghton, vice president of sales and marketing. "When it Comes to communicating expectations, planners can't be too specific. For example, Microsoft makes the details perfectly clear. For example, they specify exactly if they want the blue draped table with the white table cloth in front of room 106 facing north at 7 pm with coffee and water with two chairs or two stools, and if they need one or two easles, or rear or front screen projection…"
"The clearer planners define things, the better," adds Houghton, adding that planners consult the website www.glossary.conventionindustry.org to help them project the correct image of what they want. For example, when a planner requests a podium, that could mean a lectern with microphone and light, or a 12-inch riser. When it comes to staging spectacular events, planners have an endless array of off-site venue options to choose form. From museums, to casinos to cruise ships to art galleries to golf courses - each province boasts its own set of choices. Ontario alone boasts several exciting new scenes. After its magnificent renovation and remarkable acquisitions, the Hamilton Art Gallery, provides an elegant atmosphere for cocktail receptions. In the heart of Toronto's Dundas Square, the Olympic Spirit provides a fun-filled, challenging arena for team-building as well as lunch or dinner meetings. Angie Demeo, senior event planner with Maritz Canada Inc. in Mississauga, Ontario, has held a number of successful programs at off-site venues. Among her favourites are small movie theatres which can provide delightful evenings on their own or in tandem with dine-around programs. The Famous Players Theatre, for example, packages its services with on-site planners, technicians and even satellite technology, says Kym Larsen the theatre's marketing manager. The venue, which has theatres or relationships with theatres in every major city across Canada, appeals to Demeo its easy, one-stop shop planning shop. She recently used it for a Microsoft tour, which involved staging programs that ran simultaneously in three theatres across the country. Among the evocative venues tucked into natural surroundings, planners can find beautiful places for board retreats. Bridget Damps, secretary to the board of governors of Mount Royal College in Calgary, has for ten years organized strategic planning retreats for some 22 members of the board at the Centre for Learning at Ghost River Crossing, about 45-minutes by car from the city. "The surroundings are fabulous, the meals are out of this world, and the hosts do everything to make sure you have everything you need," she says. When taking the high profile board members away from the regular environment so they may change gears and engage in effective board development, Damps searches out restful locations. For other meetings - when group size dictates the venue selection - Damps considers Heritage Park (a living Pioneer village setting), Spruce Meadows (the glamorous race track venue) or Canada Olympic Park (for the intimate meeting room with the fabulous view at top of the 19-metre ski jump). With so many venues to choose from across the country, and so many variances within each venue type, what "constants" stand out for creating winning programs according to planning veterans?" "Cleanliness, service, someone who's willing to work with me in my budget - and that means negotiability, and some who responds immediately," says Demeo. That's a perspective that rings home with planners nationwide. According to Meetings & Incentive Travel magazine's 2005 Market Report, planners from all disciplines indicate "outstanding service" is the top reason they return to a venue. The partnership between planners and suppliers makes it happen. "It's all about painting the picture, explaining what you want to do, then dealing with people who are intellectually honest enough to let you know that what you want is logistically possible," says Houghton. "And that's why I think great planners are magicians. They manage to multitask and keep these myriad of details in their minds." Helpful hints to consider when selecting the right venue for your group. Successful venue selection starts with a clear understanding of logistics, dates, number of people, budget and key meeting space requirements. A thorough site inspection eliminates any potential challenges you may face. A high-powered investment meeting or light networking reception? Teambuilding activity or information-driven workshop? Understanding corporate objectives determines how creative you can be. Precise budget planning is essential. Knowing what, and what's not included in the price of the event is a key part of choosing wisely. Many off-site venues include honorariums where you will be charged for bringing in off-site suppliers. If you want to bring a different caterer, for example, you may have to pay a fee. Budget accordingly.